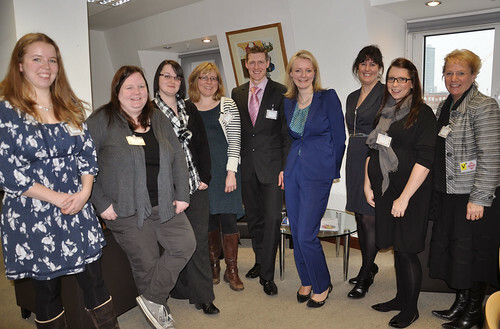 Recently I was invited down to London by Tots100 to meet with Elizabeth Truss, the Minister with responsibility for education and childcare. Along with six other bloggers we were there to discuss the new More great childcare: Raising quality and giving parents more choice paper with is currently under consultation. Currently there are 400 different childcare qualifications, so you can see what issues employers must face when trying to decide which candidate is the best on for the position. The paper details plans to change these qualifications and make them more streamlined. Introducing Early Years Teachers to build upon the strengths of the Early Years Professional programme. They will specialise in early childhood development and meet the same entry requirements and pass the same skill tests as trainee school teachers. Improving the quality of people below graduate, training them at Level 3 to become Early Years Educators. Only the best qualifications will meet the criteria set out by the Teaching Agency. All Early Years Educators will be required to have at least a grade C in GCSE English and Maths. Enabling then to act as assistants to Early Years Teachers. English child to staff ratios are much tighter than other European countries, the paper details proposals to change these ratios. 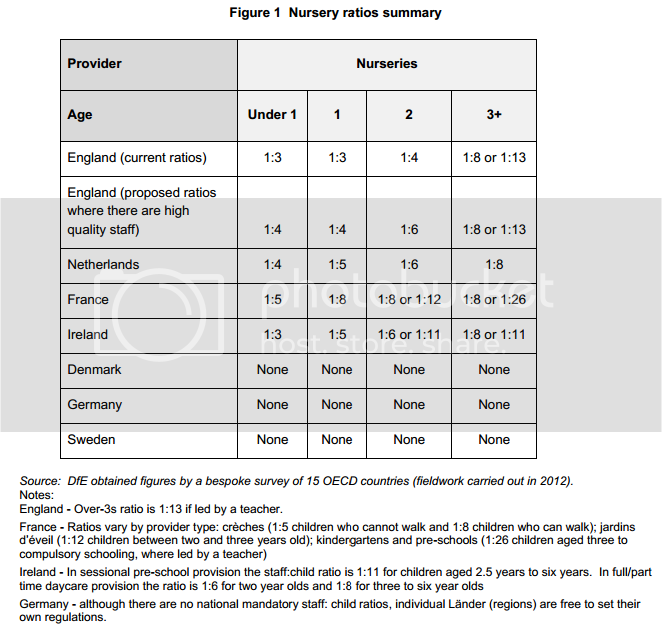 The table below details the current and proposed changes to ratios within a nursery setting. The increase in child numbers was highlighted as optional for nurseries and that they did not have to take more children that the individual nursery thought that they could main standards with. Personally I can see that some changes need to be made in the ratios, however I strongly disagree with increasing the ratio for under two’s. I believe that 1:3 is manageable and adding one extra child will take away the attention needed. Let’s not forget that under two’s are developing so much at this age from rolling over to crawling, pulling up to taking their first steps, climbing to tumbling. As any parent will tell you need to have eyes in the back of your head at this age. More flexibility for home-based childminders is proposed, currently they can look after six children, no more than three under five and only one under the age of one. Whilst remaining with six children in total the plans show an increase to four under five and two under the age of one. I have never used a childminder so it is hard for me to comment on the new proposals. The current way of maintaining standards through inspection is not working. Many local authorities carry out their own inspections and are then reinspected by Ofsted. This duplication of inspections, time, work and money is all wasted. The paper proposes that Ofsted become the sole arbiter of quality in early years, this in turn will hopefully help release some of the £160 million a year funding to the front line were it is needed. I whole heartily agree that Ofsted should become the sole governing body for inspections. I would like to see the introduction of spot inspections similar to what the NHS has with the Care Quality Comission (CQC). Parents often don’t have many options when it comes to childcare providers. This is usually down to cost, availability and flexibility. However we need to remember that whilst it is hard for parents, it is sometimes equally as hard for childcare providers. Childminders for example are often self-employed and a bogged down with the amount of paperwork, registrations etc that is needed on a day-to-day basis. With the creation of agencies it is hoped that the burden of setting up a childminding business, providing training and match childminders to parents is eased. There were several objections to this idea, however I feel that until a business model has been produced it is difficult to see if this would work or not. Personally I think sounds similar to many childminding networks that currently exist across the UK. Many schools offer a traditional nursery class for children over the age of three and this works very well. The paper proposes that this should be offered from two years. I can see the logic it this proposal but in reality I can’t see it working. Firstly, space, where are schools going to find the extra classroom space needed for a 2-3 years class? Secondly, many children are only just starting to potty train during this age group and schools traditionally do not have the facilities for changing nappies, pull-ups etc along with the assistance in potty training that day nurseries and childminders offer. By encouraging private and voluntary nurseries to employ graduates this would allow them to lead a class of 13 children instead of 8 per adult. This would give more parents the option of a traditional nursery class led by a teacher. My preference is to move my children from their current childcare provider to a school nursery once they reach three years old. This is so that they get used to the routine, the environment, the school staff and the knowledge base of a qualified teacher. By the age of three children need more than just playtime, they need to learn so I feel that day nurseries need to consider this option to encourage parents to keep their children occupied productively. Changes need to made however there is always resistance to change as the current system will be working for some parents. The ratio increases still need to looked at, I don’t see that increasing the number of children under two years is a good plan too many safely issues for me personally. Investing in staff is always good and having more universal qualifications and easy accessible training for those staff I believe will raise standards. Introducing Early Years Teachers and Educators is long over due, however more thought needs to be put into how you attract quality people for those roles. Just because someone may not have a grade C in GCSE doesn’t mean that they are less capable, less empathetic and less qualified to look after a baby/child. It was really good to discuss the paper with the Minister and to meet other parents from different backgrounds. We often have the blinkered vision to think that we are the only ones with childcare issues, we are not. Disclosure Policy: I was invited to attend a meeting with Elizabeth Truss and Tots100 in London, for which my travel expenses were paid.